No excuses NOVEMBER! The weather gets a tad colder, the Holiday parties start popping up on your calendar, you are being pulled in 100 different directions, PLUS you still have your normal day-to-day business going on! Hey, I get it, but why should your health and fitness suffer? And why at the beginning of January do so many people shame themselves and hate themselves for not taking the time to devote to themselves during November and December? It doesn’t have to be this way! It shouldn’t be this way. We have nothing unless we have our health! Think about it. 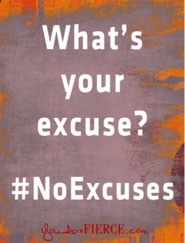 I am proposing a NO EXCUSES NOVEMBER to everyone out there and FITNESS YOU CAN LIVE WITH will be there to help you each and every day of November! FACTIOD-THE AVERAGE PERSON GAINS 7LBS OVER THE COURSE OF THE HOLIDAY SEASON! I’M NOT TALKING ABOUT MUSCLE GAINS HERE ALTHOUGH THAT WOULD BE SUPER COOL! DON’T BE A STATISTIC, GET AHEAD OF THE GAME AND COMMIT TO SOMETHING TODAY! Maybe you didn’t realize it but I offer several group classes per week which is a great way to get an affordable and fun workout in other like minded people! All group workout classes are only $15! AND did you know I offer online personal training? If you cannot make it to see me but you want to do some challenging and effective workouts at home or at the gym contact me today and I cant write you a customized plan to fit your needs! Weekly and monthly plans are available. I offer meal plans, weekly and monthly meal plans to help you navigate through your week with delicious healthy whole food based recipes to fit YOUR needs! I also offer nutritional guidance and grocery store tours. This is the biggest area where I find people need the most help and it is the most confusing area because we are bombarded constantly with conflicting information regarding nutrition. Let me help you get on track and make good choices when spending you money on food. As you can see FITNESS YOU CAN LIVE WITH can provide you with all the things you need to get you health right where you want it! Want to give the gift of health? What an excellent idea! Gift cards are available all year round! And proceed to social media to find me on: Facebook, Instagram, Twitter and YouTube! Never hesitate to get in touch with me and see how I can guide you along on your journey no matter where you might be its never too late or too early to stand and if you are waiting for that “perfect time” to start that perfect time exists and it’s called today! Next DON’T FORGET ABOUT YOURSELF DECEMBER! !